Just to keep you on your toes let’s leap over the button bar up to the main area of the Sky Mark HUD which I like to call… Umm… The main area of the Sky Mark HUD – have I covered the fact that I’m rubbish when it comes to naming things? This is where your saved presets will be displayed. Click on a preset name in order to activate it. If there’s not a preset saved on a line then of course clicking it does nothing. Pick a Windlight sky preset using whatever method you prefer – I usually use the Firestorm Quick Prefs window but anything will work. Click the green button to the right of a preset row to save it. You may notice that some preset’s name are shortened somewhat. 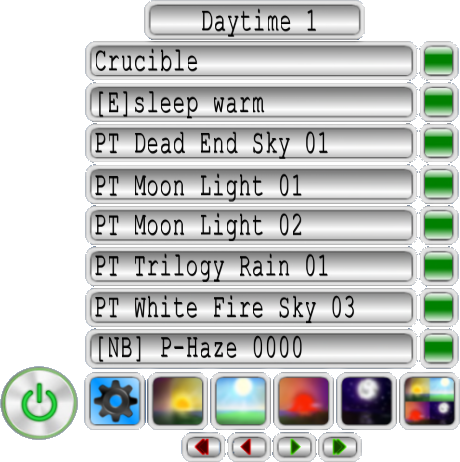 The Sky Mark can display 24 characters per line, and in order to make that as useful as possible I abbreviate some of the preset names. There’s a full list of what I change in the Apendix. Sky Mark can save custom Windlight presets the same as any of the presets that are normally installed along with the viewer. This includes but your own custom Windlight presets as well as those which you’ve downloaded and installed from sites like StrawberrySingh.com. Keep in mind however that if something happens which removes that preset – say a clean reinstall of your viewer, switching to a new computer, or even switching to a different viewer, Sky Mark can’t detect that the preset no longer exists and selecting it will do nothing when you select it. The preset name will still appear on the Sky Mark HUD, but clicking it will do nothing until the preset itself is re-installed. Unfortunately for obvious security reasons there’s no way that a LSL script can or will ever be able to query your computer’s hard drive looking for the Windlight XML files, so this is simply something that you have to keep in mind if you switch viewers on a regular basis. The last section is the Button Bar.